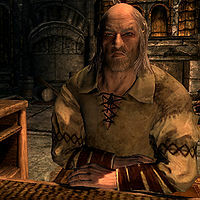 Kleppr is a Nord who manages the Silver-Blood Inn in Markarth. He is married to Frabbi and they have two children: Hroki, and Hreinn. Kleppr wears a set of barkeep clothes and shoes, and carries an iron dagger, some common items and gold, and the key to Margret's room. Walk inside the inn and Kleppr will greet you "Come on in. The Silver-Blood Inn has plenty of strong drink and clean rooms.". Kleppr has an acerbic relationship with his wife, complaining about her openly with comments such as "If I can't get you something, I'm sure my wife will bellow at me until I can." Even if Frabbi dies, his bitter attitude toward her will continue, as he'll mention that "Things are so much quieter with my darling Frabbi dead." If Kleppr dies, Frabbi will take over all innkeeper services at the Silver-Blood Inn, including renting out beds, selling food and drinks, and giving rumors. The Forsworn Conspiracy: Investigate a murder in Markarth to discover a sinister plot surrounding the Forsworn. Special Delivery: Deliver a purchase agreement to Kleppr in Markarth. Frabbi: "Unlike my husband Kleppr, I watch after our guests." Kleppr: "What was that you said, venomous wife of mine?" Frabbi: "Nothing, you pig-headed oaf!" Kleppr: "Frabbi, a customer needs a drink!" Frabbi: "Too lazy to give him [sic] a drink yourself? Oaf." Frabbi: "You want a drink?" Frabbi: "Depends. Are you thirsty, hungry, both?" Frabbi: "All the wood furniture in this inn is rotting to the core. Do you know why that is, Kleppr?" Kleppr: "I don't know, my darling wife. I assume you're going to tell me?" Frabbi: "It's rotten because the wood is cheap and its [sic] soaked with ale! Now we'll have to replace all the furniture before bugs set in." Kleppr: "Don't worry, my love. Just show the bugs your adoring face, and they'll scurry away in complete fear in no time." Frabbi: "You're an idiot, Kleppr. Why did I ever marry you?" Kleppr: "Not a day goes by I don't ask that question myself, my dear." Hreinn: "Father, why do you and mother fight so much?" Kleppr: "We don't fight, son. We, um, talk. Loudly." Hreinn: "Will I need to talk so loudly with my wife when I get married?" Kleppr: "Dibella's Heart, son, I hope not." Kleppr: "How are your chores coming, my son?" Hreinn: "Today I've cleaned the linens, washed the floors, and checked in on all our guests." Kleppr: "Ah, my son, you'll be a fine innkeeper someday, like your father." Hreinn: "But mother says you're a terrible innkeeper!" Frabbi: "That's right! Worst innkeeper in all of Skyrim!" Kleppr: "Never mind your mother, Hreinn. You listen to me, and you'll be a great man one day." Kleppr: "Playing tonight, Ogmund? Everyone here is anxious to hear the old ballads performed by the True Skald of the Reach." Ogmund: "Son, I know thousands of the old ballads. If I played all of them, everyone in this inn would be as grey as I am before I finished." Kleppr: "Uh, right. Maybe just one of the popular songs, like "The Slaying of the Falmer Princes"?" Ogmund: "That's a sensible lad. Now fetch me drink." This page was last modified on 23 January 2019, at 16:14.